Cruise Lines International Association (CLIA) and European Cruise Council (ECC) oceangoing member lines will implement an additional safety procedure regarding the loading of lifeboats as part of crew training, effective immediately. Exceeding current international regulatory requirements, the new “Lifeboat Loading for Training Purposes” policy is the result of the Cruise Industry Operational Safety Review launched post-Concordia. 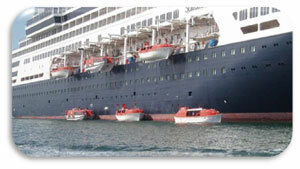 The policy requires the full loading of a lifeboat at least once every six months during crew training sessions. Lifeboats will be filled to capacity with crewmembers and lowered into the water to ensure complete familiarisation of lifeboat operations. Involvement by all crewmembers involved in operating or loading the lifeboats is mandatory. “The cruise industry continues to work on a global level to improve the safety of passengers and crew, which is our number one priority,” CLIA president and CEO Christine Duffy said. “Since January of this year and in keeping with our efforts to continuously improve operational excellence, the global cruise industry has voluntarily adopted seven wide-ranging safety policies. ECC executive David Dingle confirmed that the new policy has been verified by marine safety experts and underlines the organisation’s commitment to continuously improve safety for both passengers and crew. “We are determined to ensure that cruising remains the safest holiday choice,” Mr Dingle said.